Selling Your Home in Utah County: Price Too High - Solution: Have Team Teasdale prepare a free no obligation current market analysis (CMA) of your home’s value. Being a Penny Pincher - Solution: Sellers often think their homes will sell with just a sign. In fact, less than 5% of Buyers in Utah find a home from a sign. About 90% of the Buyer's find their next home on the internet. You must spend money advertising throughout the internet including a virtual tour. Utah Buyers First Impressions - Solution: Sales have been blown by unkempt lawns, cluttered closets, unpainted front doors, hard to work locks, blown light bulbs, bad colors, stains, unlit areas, and bad smells. Spend some time on the little things. Keep things cleaner than usual. Pay attention to your gardening. A well-manicured lawn, neatly trimmed shrubs and a clutter-free porch welcome buyers. This is an excellent tip to selling your home in Utah County. Not Making the Right Kind of Repairs - Solution: Some upgrades will not yield any real increase in value, while others may increase property value substantially. Utah County sellers often want to do the repairs that don’t need doing. Don’t skip the important repairs. I will guide you with which repairs need doing and which don’t. 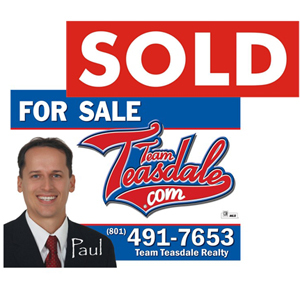 I (Paul Teasdale) have been walking through homes in Utah County with buyers since 1995. I knows exactly which repairs matter to buyers in Utah. Clutter and Junk - Solution: This is the number one problem with showing homes in Utah County. Most homes are over cluttered. I suggest spending a few bucks at Wal-Mart on some storage bins. They usually just cost around $4 each. They even come in different colors. Pick your favorite color and start filling those starving bins with all that clutter above your fridge. Store your bins in an organized manner in your garage or basement. This will not only make your Utah County home sell better, it will also make your move a little easier when your home does sell. Consider your closets. Testing the Market - Solution: Never put your property on the market in Utah County unless you really want to sell it! A home that is sitting on the market, unadvertised or overpriced, is bad. Every buyer asks how long the home has been for sale. Utah County buyers want a discount if a home has been sitting on the market for a while. This is an excellent tip to selling your home in Utah County. Using the "Hard Sell" During Showings - Solution: Buying a house in Utah County is an emotional decision. People like to ´try on´ a house and see if it “fits” (it’s comfortable for them). If you are following them around, pointing out every improvement that you’ve made, it is difficult for the buyers to make this decision. This approach may even produce the opposite effect you desired, by making them feel they are intruding on your private space. Not Having Contracts and Disclosures - Solution: I use the Real Estate Purchase Contract (REPC) approved by the state of Utah for Realtors. I also use the six-page Seller’s Property Condition Disclosure. A seller is required by Utah State law to make full disclosures of any material defects with the home. Having the proper paperwork is very important. Mistaking Lookers for Buyers - Solution: A qualified buyer is one who is ready, willing, and able to buy your home. We find that most people who go looking at “For Sale By Owners” are just starting to think about moving. They may potentially be good buyers, but they are usually 3-9 months away or more from being ready. They do not want to bother an agent yet, so they call the ´´By Owner´´ ads to get a feel for what is available. They may have a home to sell first, need to save some more money, or may even have credit that needs fixing. Like a good detective, you must gather information about the Utah buyer first. Here are some of the questions I ask: Who is your lender? How much have you been qualified for? Do you have a home to sell first before you buy? How long have you been shopping? What month are you looking to move? Have you looked at very many homes? I tactfully ask dozens of pre-qualifying questions. If the buyer is not serious or currently qualified, I will not show them the home. If an unqualified buyer wants to see one of my homes, I will have my lender contact them to pre-qualify them for a loan first. If you don’t ask the right questions before the buyer crosses the threshold of your door, you may have a parade of Saturday afternoon shoppers with a dream of owning a home in Utah County someday. Not Answering the Phone and Emails - Solution: Utah County buyers want information immediately. If they get a voicemail, most buyers just hang up without even leaving a message. Advertise a phone number that is always available. Otherwise, you may be missing good buyer leads. I forward my office number to my cell and rarely let a call hit my voice mail. Within 10 seconds of sending me an email, my phone is paged with the message. If you advertise online, you must answer your email inquiries as quickly as possible. It’s my job to always be available to my customers. You, too, must always be available. This is an excellent tip to selling your home in Utah County. Blasting Music - Solution: Rock-and-roll will never die. But it might kill a real estate transaction. When it’s time to show your home, it’s also time to turn off the stereo or TV. It’s amazing how many people have radios and/or TVs blaring during a showing. I recommend no music at all. In a few cases, soft classical must is appropriate. Prepare a quiet environment for your buyers. They need to think about where their couches will fit. A Dog and Cat in the HOUSE! ARGHHH! - Solution: Dogs and cats are great companions, but not when you're showing your home. Pets have a talent for getting underfoot. Do everybody a favor: keep Kitty and Spot outside, or at least out of the way. If you have a dog that barks, consider asking someone to take it for a walk prior to the showing. Excited Kids at Showings - Solution: I love children. In fact, I have six of my own. When I sold my own home, my wife would take my children for a picnic, walk or drive during all showings. This enabled my buyers to concentrate on the home. If you have children present at a showing, it is important to keep them quiet in one room. Don’t let small children follow the tour or chit chat with the buyers. This is very distracting. Most of my showings in Utah County are done without anyone home. This is an excellent tip to selling your home in Utah County. Shut Out a Sale - Solution: If any of your cabinets or closet doors stick, you can be sure they will also stick in a prospect’s mind. Don’t try to explain away sticky situations. A little effort on your part can smooth the way toward a well-deserved closing. Getting Frustrated by Activity - Solution: Sellers often become frustrated with the amount of calls and activity they are getting on their home. Carefully re-evaluate your marketing and price. Consider hiring a Utah Realtor at this point. I recently sold the Owens’ home. The home actually sold to my first buyer. Unfortunately, the Owens’ had been trying to sell their “For Sale by Owner” home for 10 months with over a hundred showings. Getting one qualified buyer excited about a home is all it takes. This is an excellent tip to selling your home in Utah County. Not Providing Easy Access for Showings - Solution: If a qualified buyer calls to see your home, you must accommodate your new customer as soon as possible. If your home is easy to show, more prospective buyers will see it, therefore, improving your odds of getting the deal you want. Realtors use convenient keyboxes, which enables the sellers to leave before the showing or have their home shown when they’re gone. Not “Staging” Your Home Correctly - Solution: Create more light, make sure your house smells fresh, or otherwise improve the ambience. This is an excellent tip to selling your home in Utah County. Believing the Selling Property is Seasonal - Solution: Don’t base your selling decisions on the seasons. Homes sell year ‘round in Utah County. Pricing Your Property Too Low - Solution: Believe it or not some sellers price their homes too low. Be sure to have a professional opinion from an experienced Real Estate Broker about your home’s value. I would be happy to provide you with a free market analysis. Just call me. This is an excellent tip to selling your home in Utah County. Delivering Flyers to Neighbors - Solution: This is another marketing strategy that is a waste of time. Your neighbors will see that your home is for sale and will surely grab a flyer if they have a friend that may be interested. No Follow-Up - Solution: Ask for the buyer’s name and phone number before they see your home. Call the buyer the day after your showing to get feedback. Ask the following questions: What things did you like or dislike about our home? Would you consider making an offer? Would you like to see the home again or, perhaps, show it to a friend or relative? Plan ahead - Don’t panic and try to find paperwork at the last minute. Read and understand your forms or you may make critical errors. Get your forms now and review them. Don’t rely on a title company to do the paperwork for you. The title company will often just pass you the forms, without any explanation. A Realtor and/or a lawyer may discuss the details of a purchase contract. You are responsible for understanding the contracts you sign. The scout motto applies here: “Be Prepared.” I can e-mail or fax you the forms you need for free. Disappearing Host - Solution: Don’t let Utah County buyers walk through your home on their own. That is totally lame. The buyer feels naturally awkward viewing your home with you present. They feel even MORE awkward parading through your master suite without you home. Walk through each room with them and give a simple description of the unobvious features. Only one tour host is necessary on a tour.